As I sit down in my room, alone and lonely, on this friendship day, wondering about my life- my past and my present; I ask myself whether that it the life which I had actually wanted to live. The answer comes from within me, in negative. I had never intended to live in such a way but then why it happened with me? 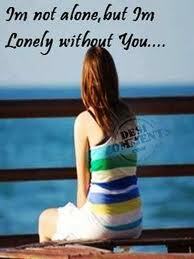 Why I am the person who is always so lonely and alone? I wish to rewind my life and go back to those times in my life where I was a year ago. The life which I had lived before was so good and that was that time when I had actually believed in those relations like love and friendship. But then I wonder what changed me so much that I have chosen to live in the way I had never intended. I just keep wondering what changed me so much that I have now preferred to live alone wholly without even a single friend in my life. I go down to my memory and remember those times I spent with you, with the best ever person I had ever known in my life, with my best friend, my best buddy but these memories just make me cry more. Although I don’t want to cry, but still tears keep falling off from my eyes like a stream of water newly generated from those happy memories. I remember those times when we actually meant so much to each other; when talking to each other even for hours did not complete our talks; when wishing each other first on every eve was a habit; when a single drop of tear from my eyes made you cry too and when a simple but genuine smile on my face meant your world to you. But with that phase of my life being over, I feel that my life itself has actually come to a halt. With you being in my life, I had spent each and every moment happily and cheerfully but with you gone, even the happiest of moments can’t make me smile genuinely. I don’t just know where actually my life is heading to this way but then I feel had I been a bit sincere about our friendship, I would still have had you, the most precious possession I had ever had, with me, by my side. I look down onto my mobile phone every now and then wondering whether you’ll at all care to text me wishes for the friendship day but then with no hopes, I just switch it off. I don’t know what has happened between us in some time but truly, life does actually mean to live with the memories because it is, in reality, those happy memories which is making me live now. But then, I also live with that hope that someday at least, you’ll feel a bit of emptiness in your life and want me back too. I prefer to live with this hope wondering if at all it will ever come true. Are you happy now? Are you free..? Why you so angry? Why you so mean? Can’t you see that you're hurting me…? Can you hear them? Can you feel me sigh? Because you own me, you hold the key..
just follow the natural course of your life, forget the past, it'll never comeback... look at the future and amend it before any thing happens...!! Rest, God Bless You.